This is our 5th and final post in this series. Click these links to read the previous posts. We have a very short growing season (about 77 days frost to frost) and the climate here is cold, dry, and windy. Even in the summer we often go down into the 40Fs at night. And we often get wind gusts up to 100 mph in the winter. All these things present challenges to gardening, but we have found several successful ways to overcome them. Due to our dry climate, supplemental watering is an absolute must-have for the garden. We have found that a drip system is the most economical way to go, and the plants seem to love it too. I describe the system and installation in more detail in a previous post, which you can read by clicking here. We also use rain collection barrels to help water our garden areas and save us on water bills. If this is legal in your area, it is an excellent way to water your garden and takes advantage of what rain you do get. We have purchased barrels, but they are so expensive that we prefer to make our own. To read about how to make them click here. The wind mostly occurs in the fall/winter/spring, which are not big gardening times for us. The way it effects the garden the most is by blowing away some of our soil each year, blowing away our mulch used to cover over-wintered plants, and wreaking havoc with our hoop tents and other season extenders. As I discussed in the post about soil, we add a layer of compost to the entire garden each spring. This helps make up for the soil loss from wind, and adds necessary nutrition to the garden soil. We often use straw to help insulate plants that we are overwintering in the garden for second-year seed saving. The wind will happily remove that straw for us, so we use bird netting over the straw and put rocks to hold down the corners of the bird netting. 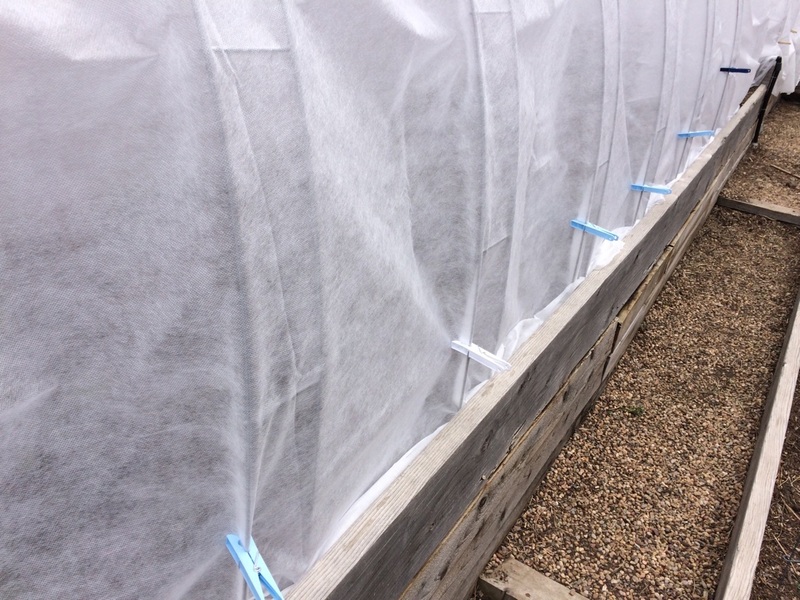 As for the wind trying to blow away our hoop tents and other season extenders, we use clothespins to hold the fabric on, and we secure the end hoops to the wood of the raised beds when needed. We also utilize long garden ground staples to help hold things down. One of the most important things we do to have a successful garden in such a cold climate with a short seasond is choosing the right varieties of veggies, ones that are suited for this climate and mature very quickly, and saving our own seeds from the plants that are successful in our garden. Our favorite high-altitude cold-climate seed company is Seeds Trust. We have had great success with the seeds we get from them. Each garden is its own micro-climate, no matter if it is in a similar climate as another garden or not. Because of this, saving seeds from your own garden is a great way to increase the success of your garden because you are saving from plants that have done well in your own little garden micro-climate. Always save from the best, most productive, and most disease-resistant plants. I also usually try to save from the first-ripening plants as long as they meet the previous standards, because with our short growing season I want plants that mature as fast as possible. My favorite book on how to save seeds is The Complete Guide to Saving Seeds by Robert Gough and Cheryl Moore-Gough. It is also important to choose vegetables that like cold weather. If you fill your garden with all hot-loving veggies, you are not going to have much success. Not that you can’t grow hot weather veggies, but they are going to take a lot more effort and maintenance and will likely not produce very well. We have great success with beans (green beans and drying beans), beets, cabbage, celery, carrots, garlic, kale, leeks, lettuce, onions, peas, peppers, rhubarb, spinach, tomatoes, turnips, herbs, strawberries, gooseberries, and grapes. We have had some success and some failure trying to grow cucumbers, pumpkins, winter squash, and zuccini. We are continuing to try to find ways to make those successful. We start some plants indoors and transplant them as seedlings, and some are direct planted into the garden. We base our planting schedule based on the last frost, and the first frost. We have tweaked this schedule based on our garden and how things work well in our garden. It is a starting point for your garden, but not necessarily exactly right for your garden. It is important to take good notes and journal your gardening experience year after year, using those notes to tweak your plans to increase the productivity of your garden year after year. Someday we hope to have a greenhouse, and that will open a whole new world for us as far as gardening goes. But for now, we use other season extending methods to grow the heat-loving veggies. We are able to successfully grow tomatoes, peppers and herbs by finding ways to extend their growing season. We start the seeds indoors 10 weeks before the last frost. Then we transfer them outside into Wall-O-Waters 4 weeks before the last frost. We have tried many different season extenders, but the WOWs have by far worked the best for us for heat loving veggies and herbs. They are somewhat expensive, but if you take good care of them they will last for years and years. It is important to fill the WOWs with water and set them in their locations at least 24 hours before planting in them. They need that time for the water temperature to settle. These WOWs are great for extending the season in the spring because they fit nicely over a small seedling. But they wont help the tomatoes, peppers, and herbs come first frost in the fall. 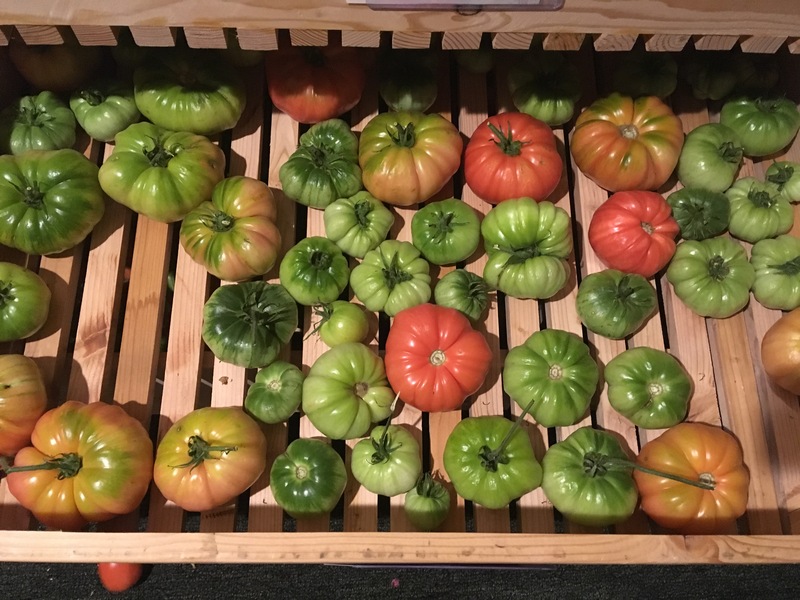 To deal with that we harvest before the first frost, even when the veggies are not ripe yet, and we put them in our basement (60F degrees) to ripen. At first we used to put them on tables in a single layer. 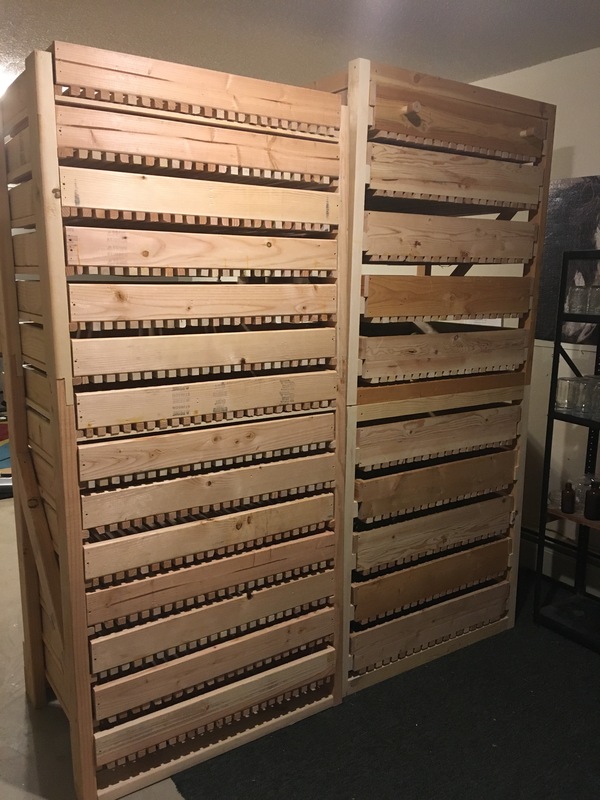 But this last fall we built some awesome root cellar racks to put them on, which saves us so much space. 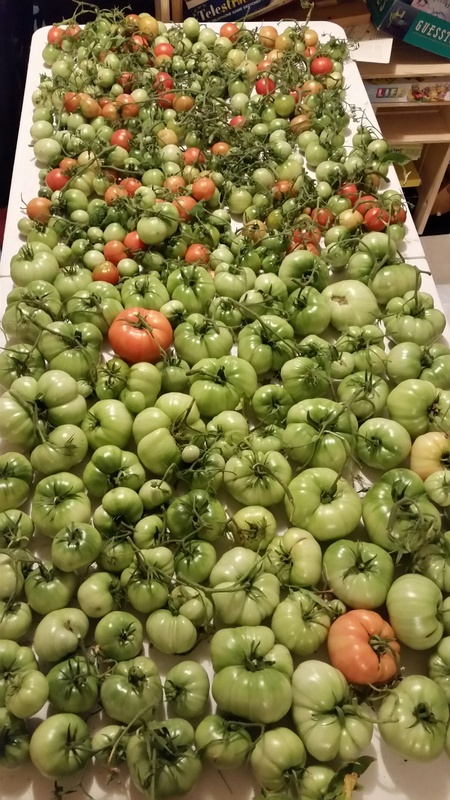 To read more details on how we successfully grow tomatoes with such a short growing season and cold climate click here and here. 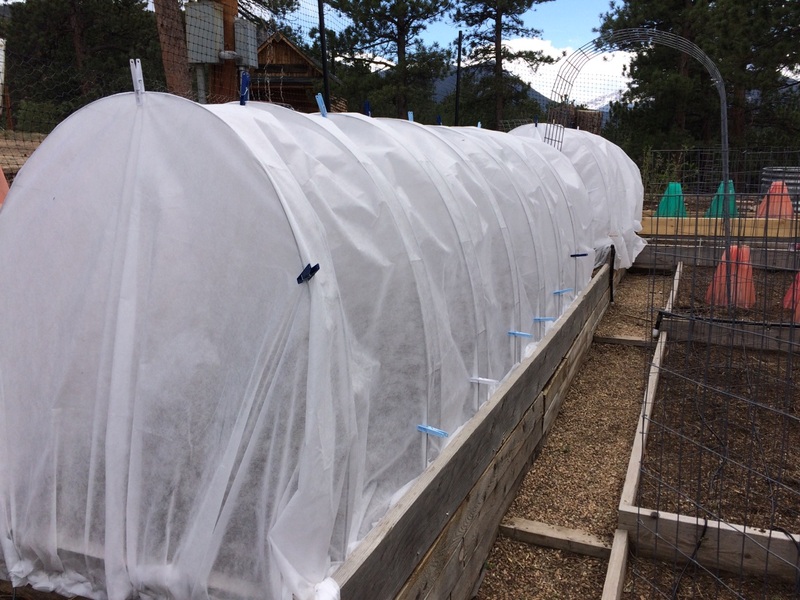 For the veggies that are a more cold tolerant, such as cabbage, beets, turnips, spinach, and lettuce, we are able to extend the season both in the spring and the fall by putting frost fabric hoop tents over them. These tents also prevent pests. We have minimal garden pests up here at high altitude, compared to warmer climates, but we do have some and these tents help a lot. We use the all-purpose fabric, but by utilizing even heavier fabric, the season can be extended even farther. 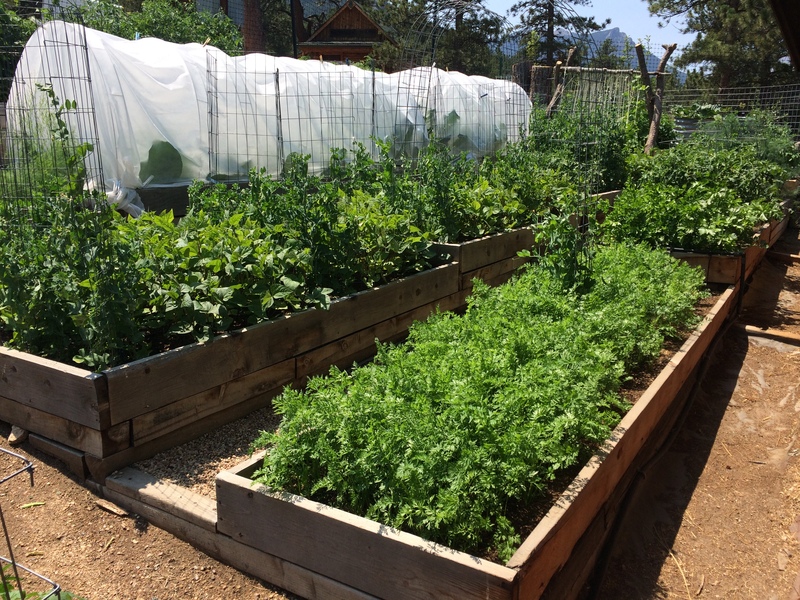 The climate in the high-altitude Rockies can seem to make it impossible to garden successfully, but with some special care you can have success growing your own produce. 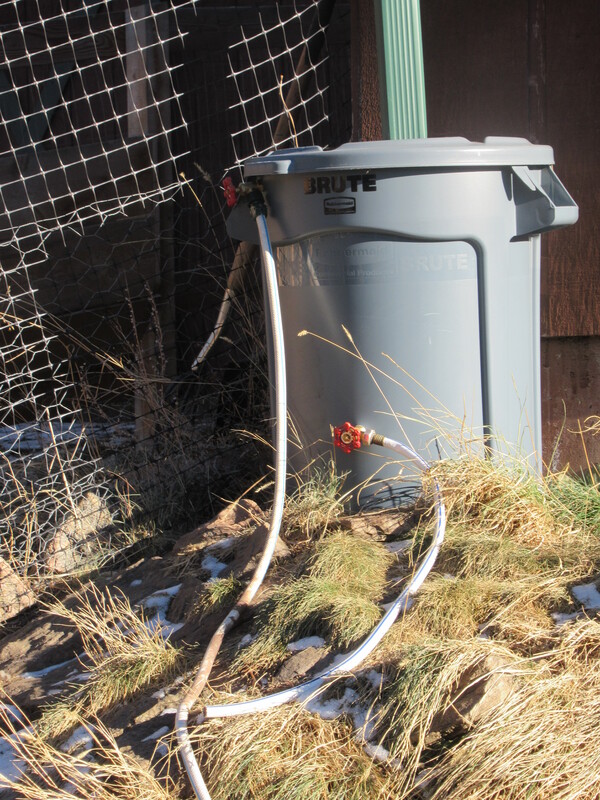 Use a drip system for watering and take advantage of rain barrels if legal in your area. Add compost to the garden each year to replace soil loss. Use clothespins, bird netting, and long ground staples to hold down your hoop tents, season extenders, and overwintering straw. Choose varieties made for your climate. Save seeds from your own garden to increase productivity specific to your garden microclimate. Plant vegetables that like cooler weather. 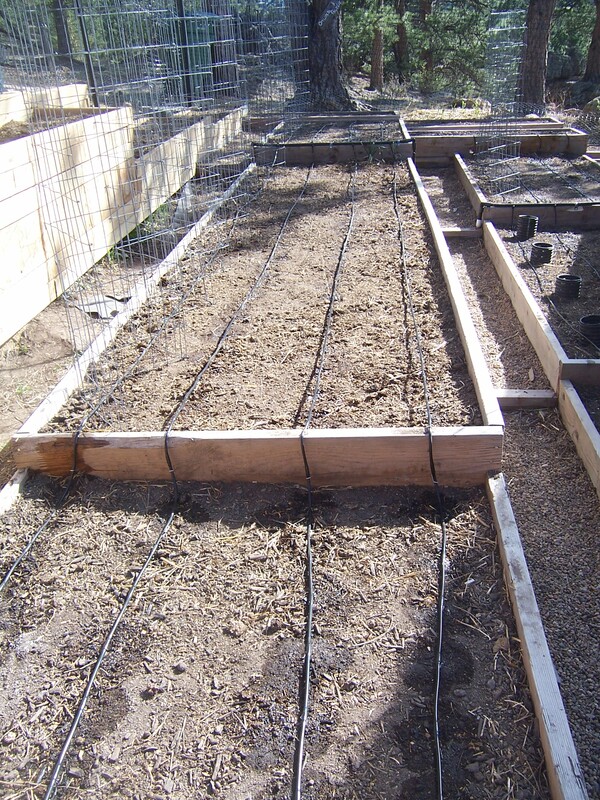 Utilize season extending methods to grow vegetables that like hot weather. Specifically by starting indoors, using WOWs, harvesting before the first frost, and ripening indoors. We have now discussed all the different ways we make our high-altitude, cold-climate garden a success. There are a lot of issues to overcome, but when dealt with properly you can have a super-productive summer season garden that produces enough to feed you year-round. This is our 4th post in this series. Click these links to read the previous posts. Now we will discuss wildlife. 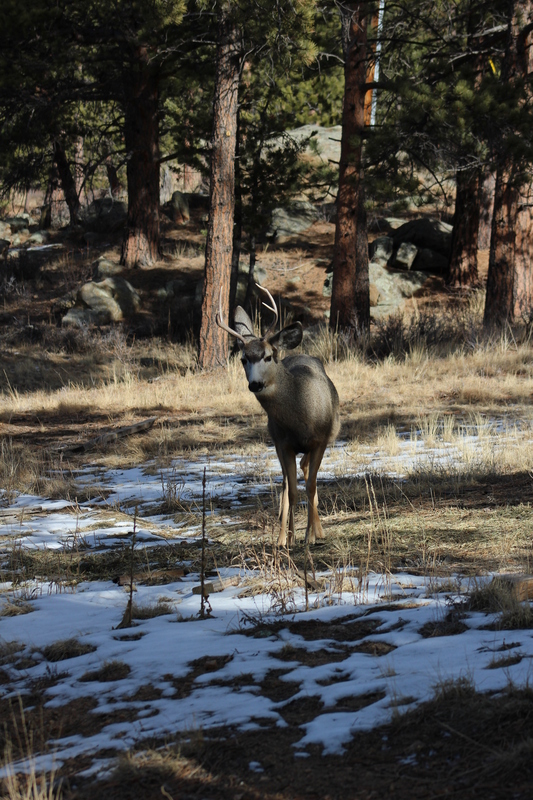 Living in the high-altitude Rockies gives us plenty of beautiful wildlife to view. Not a day goes by without some sort of wildlife moving through our property. It is such a blessing. But it also presents a challenge for our garden. The specific critters that can cause problems in our garden are deer, elk, rabbits, rodents of all sizes and kinds, raccoons, and bears. So let’s break it down into categories by animals. 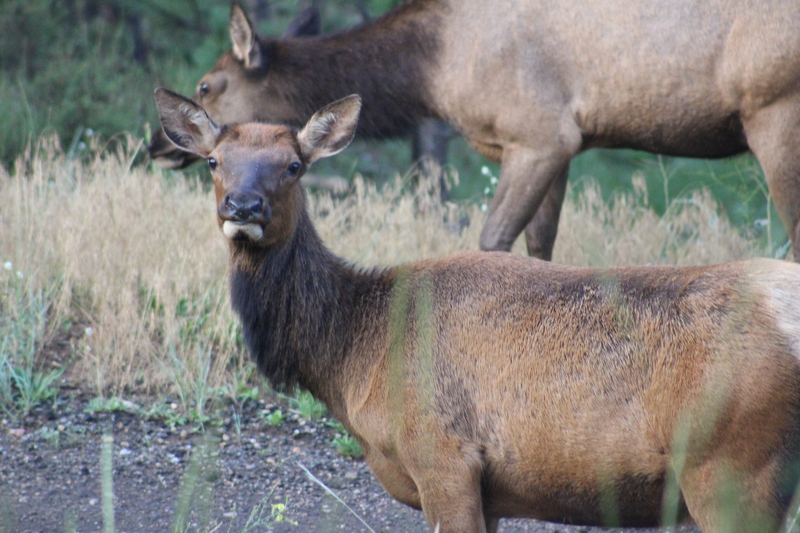 Both elk and mule deer are prevalent in our area. We have herds of up to 200, although most of the time the elk are in groups of about 20-30 and the deer are in groups of 5-7 when they come through the property. 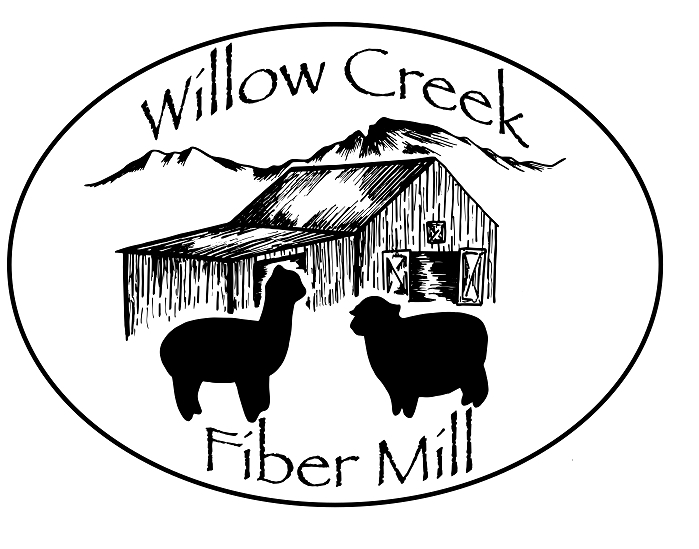 They are happy to graze on anything and everything, from plants and veggies to berry bushes and fruit trees. They also will rub their antlers on trees, sometimes aggressively, and can break and kill a small tree easily when they do. And they are very acclimated to humans, so they don’t mind coming right up to the house and in human areas to get what they want to eat. They are the biggest wildlife challenge we face in the garden. The answer for these animals is easy – fencing. Anything they like to eat MUST be inside of a 6 foot+ fence (they can jump 5 foot fences). They don’t care much for onions and garlic, so we plant those outside of the fence. And we have also gotten away with planting squash and pumpkins outside of the fence, as long as we keep a close eye on them as the fruit begins to ripen because elk and deer will happily eat a ripe squash or pumpkin. But they wont eat the leaves and the plant itself. Because we love the views up here and don’t want to have 6+ foot tall fences blocking our views everywhere, we chose what are sometimes referred to as “invisible fences.” They are made of a black mesh that pretty much disappears from view when you back away from it and doesn’t take away from the beautiful mountain views. Here is a picture of the garden area. The far edges have the fence going along them, but you can’t barely see it there. Click on the pic and examine it. Look to the right side of the photo where there is a metal trough in the background…now look at the mountain to the left of that. You can kind of see the black mesh, but it doesn’t really take away from anything. And can you see those skinny black posts? There is one right in the center back of the photo, in the back corner of the garden, and there is one to the left of it before the power pole. Those are what hold the fencing up. And speaking of those posts…they add another benefit to this type of fencing. Living in the high-altitude Rockies means rocky terrain which makes it near impossible to dig fence post holes. And even if you can dig one or two, by the time you get to the third you can’t get it dug where you want it and if you want to put it in you have to move it 2-3 feet right or left and you end up with a zigzag fence line. The posts on this type of fencing are super-easy to install. They come with receivers that you pound into the ground and then you just slide the post into the receiver. The receivers are narrow enough that we haven’t had a problem getting a pretty straight fence in as we run into rocks during the process. …rabbits and rodents can chew through it. Which brings us to our next wildlife challenge. We have plenty of cottontail rabbits around, as well as mice, voles, moles, chipmunks, ground squirrels, gophers, grey squirrels, and pack rats. Any and all of them would love to have a meal in our garden. 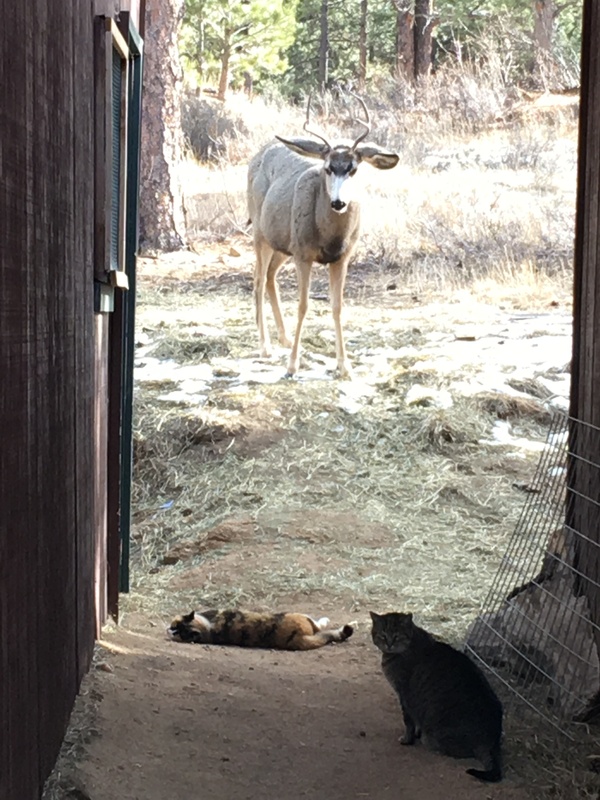 Our first line of defense against the rodents is the barn cats. 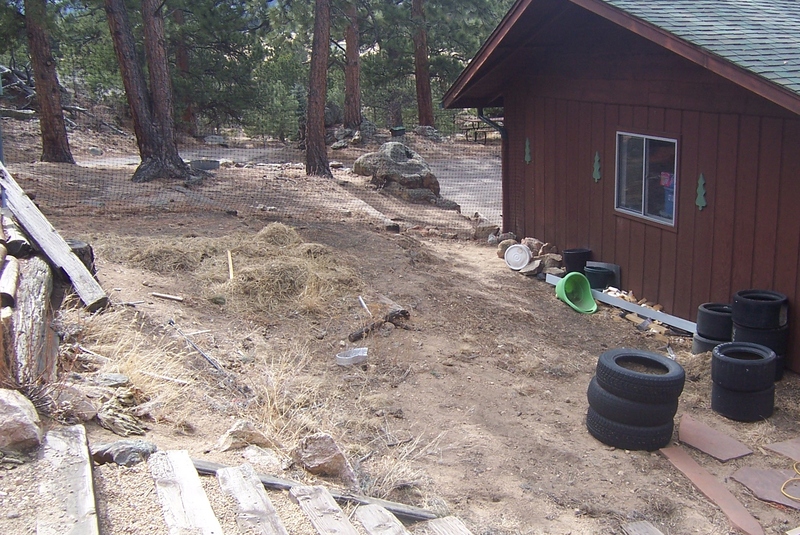 They keep the property pretty cleaned out of mice, chipmunks, ground squirrels, gophers, and pack rats. But the cats are not allowed in the garden area, since they think the soil makes a perfect litterbox, so occasionally a rodent eludes them and makes it to the garden. So we keep mouse traps set around the garden here and there to take care of that, and also a couple of the bigger rat traps set in carefully chosen locations to be sure the kids don’t get hurt by them. Also, if we find that we have a visitor munching on the garden we look for tracks and signs of what size and type it is and we set live traps over night to catch them. 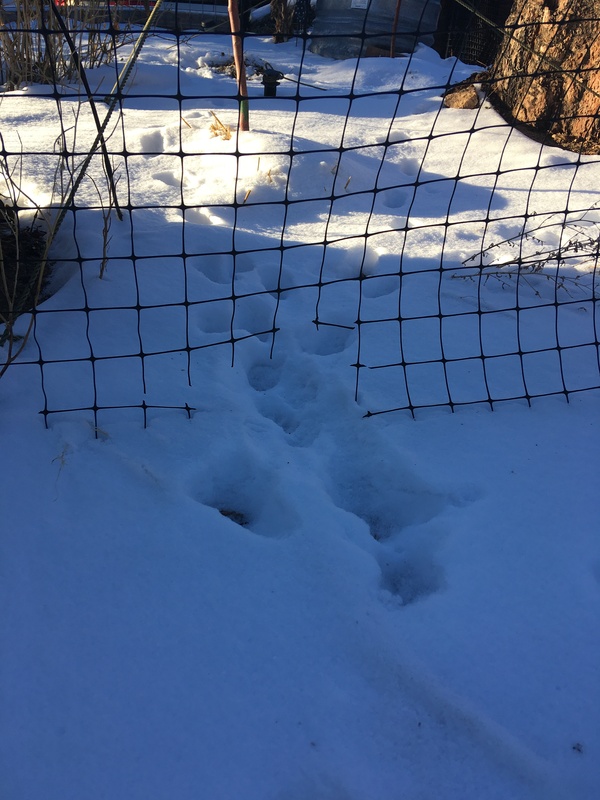 To keep the rabbits out we use chicken wire attached to the bottom foot of the plastic mesh fence and then buried out another foot from the fence. This keeps them from chewing the mesh and also keeps them from being able to dig in too. You can see it in this picture here. The rabbits are also happy to squeeze under gates or in the gaps between the gate and the fence. 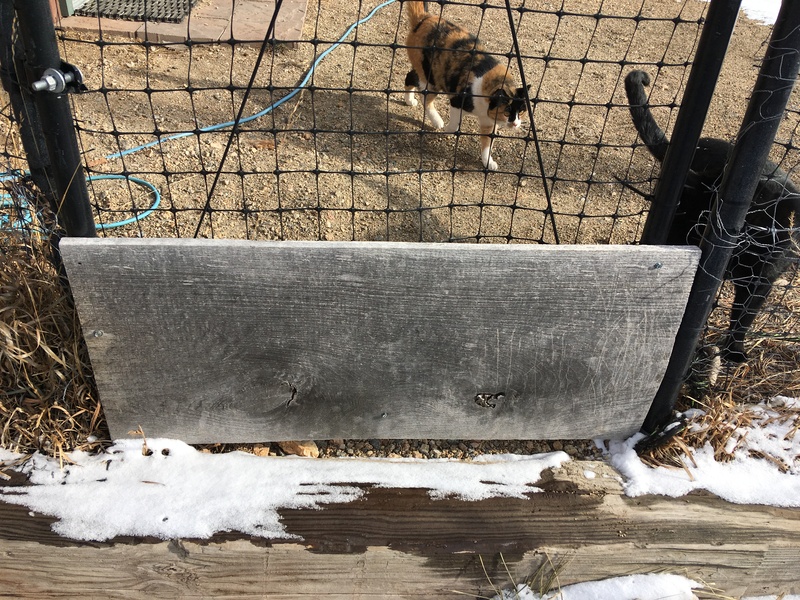 We use wood on the bottom part of the gates that closes all those gaps enough that rabbits can’t fit through. Voles and moles have on occasion made their way into our garden beds. We have tried many different traps and methods of dealing with them with no success. The only way we have gotten rid of them is to let the barn cats into the garden at night and they have been able to catch them and kill them. It does risk some damage to the garden in the process, but the moles and voles do a ton of damage themselves so it is worth it. Thankfully, they rarely show up. Thankfully, raccoons and bears have caused us very little trouble in our garden (the barn and coops are another story – but the gardens not so much). We have never had a raccoon problem, but we know other people who have. A live trap left out at night is a good option, but that always includes the risk of catching a skunk by accident. 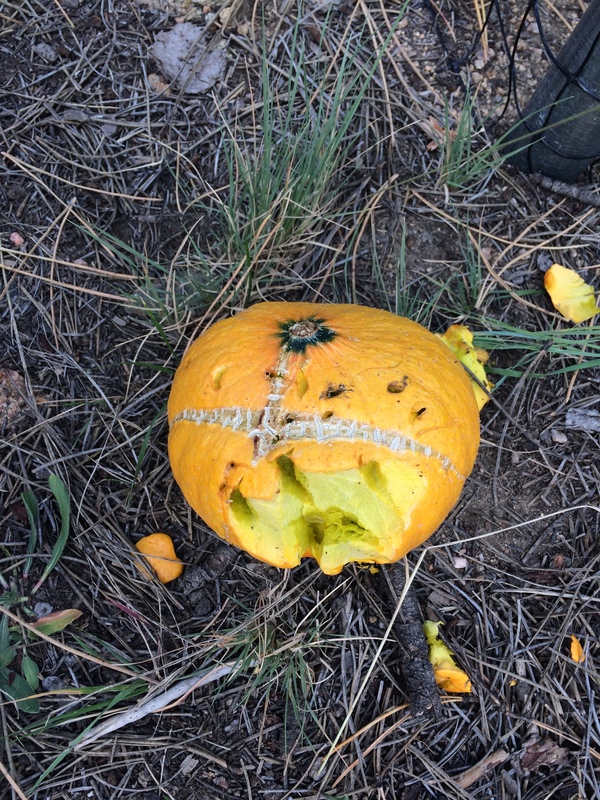 We have had one bear try to munch on our squash, but apparently he was not happy with how unripe it was so he left it after chewing on it. We are pretty lucky that the local bears are not very interested in garden fare, because there is very little that can be done to keep a bear out of the garden. The 7-foot fences are a deterrent, but if a bear wanted to he could easily chew and rip through the fence. If they posed a big problem we would likely invest in some electric fencing to keep them out. But with kids running around the homestead, that is not an ideal scenario. So far, we have not had to face this issue, and I hope it stays that way. 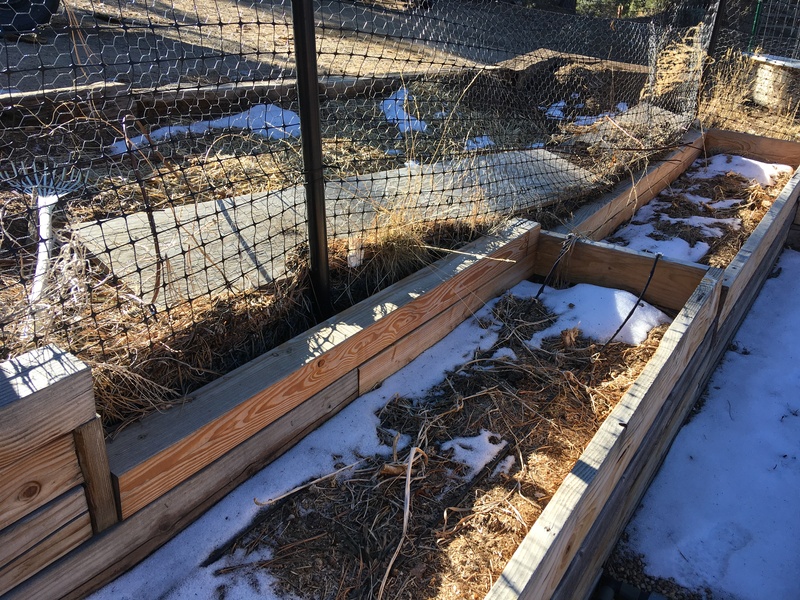 If you aren’t interested in sharing your garden produce with wildlife, proper fencing and trap management is a must-have for a high-altitude cold-climate garden. Install 6+ foot high poly deer fence (invisible fence) around garden areas. Use the type with pound-in receivers to make post installation easier in the rocky terrain. Plant onions and garlic outside of fenced areas to make use of all fenced space for fruits and veggies that wildlife likes to eat. Attach chicken wire to bottom 1.5 feet of fence and bury out from fence another 1.5 feet to keep rabbits out. And reinforce the bottom of gates with wood that closes the gaps on each side of the gate. Keep mouse and rat traps set inside the garden to catch rodents. Be safe about where to put them to protect human gardeners from getting hurt. Set specialty traps if you find you have a specific type of rodent visiting the garden. Now we will discuss overcoming our soil challenges. 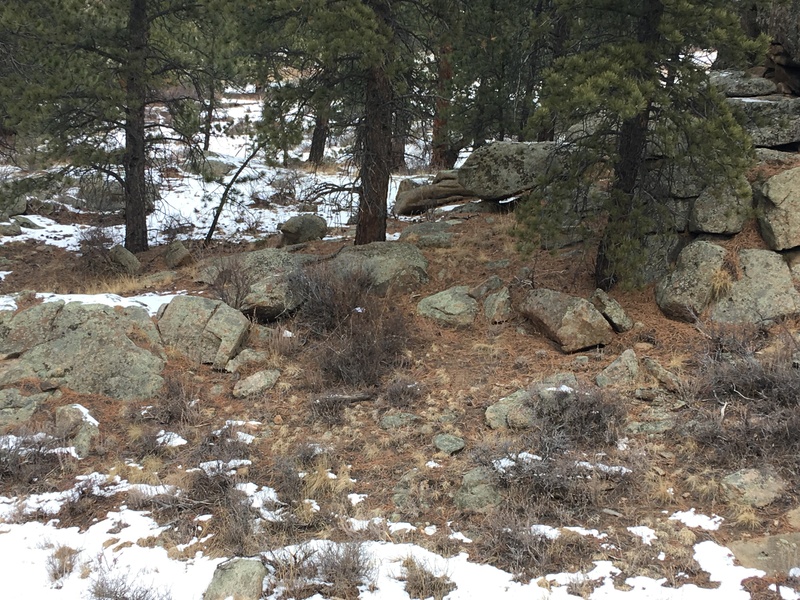 Living on a rocky mountainside leaves us with soil that is decomposed granite. It doesn’t retain moisture, or heat, and it is low in nutrients. We also have a lot of pine needles constantly falling from the Ponderosa Pine trees that add too much acidity to the soil. 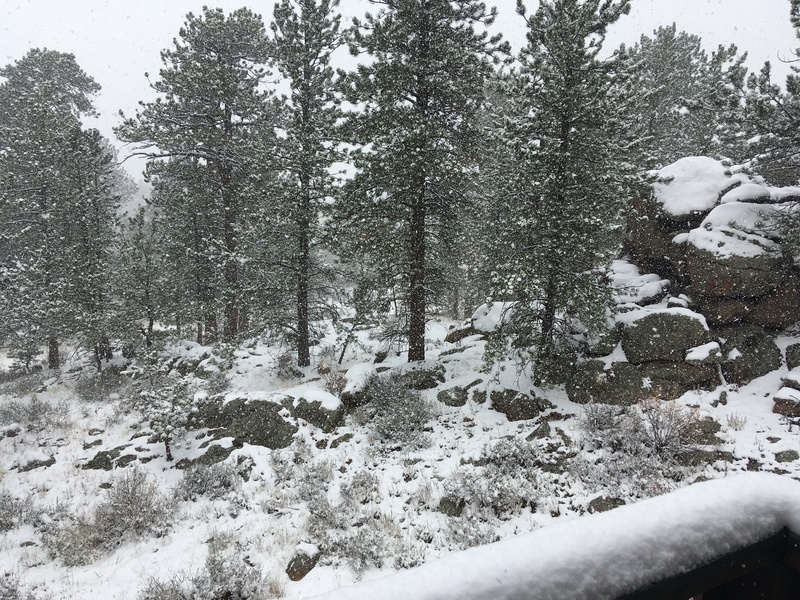 The natural forest around us consists of plenty of pine trees, with rocky outcroppings scattered around as well as some large piles of huge rocks, some shrubby bushes, and a carpeting of pine needles on the ground. There are few plants and grasses that happily grow in the carpet of needles and the rocky soil. Even though this is a winter photo, you can still see what terrain I am describing. Trees, lots of big rocks, and the scrubby bushes. In this closer view you can see the small patches of brown grass and the carpet of dried brown pine needles. In the summer the difference is that the bushes are green with little leaves, and there are small amounts of light green grasses and small plants here and there. But it would never be considered a lush green and growing area due to several factors, especially the soil. Here is one more photo, again taken in winter, but you can see the thin brown grasses, many of which are brown or light green in the summer and still very sparse, and the pine needle carpet, and in the background you can see the trees and rocks. One last thing I would like to point out in this photo is the shade. See how much shade there is? The abundance of pine trees causes that, and it is also not helpful for growing plants. Overall, terrible soil for growing plants. As I discussed in the last post, about overcoming the terrain, we terraced our garden area and built raised beds. As you can see in the background of this photo, there were 3 big pine trees right along the edge of the garden. There are no pine trees anywhere else around the garden, even behind where I am standing to take the photo. But those 3 trees dropped tons of pine needles into the garden soil (acid) and caused too much shade. So they were eventually removed and we have since then planted a couple of apple trees in that area to provide small amounts of shade and no acidic needles in the soil. Some shade is important for a high-altitude garden because the sun is more intense at high altitude. The terracing and raised beds were done because of the steep terrain, but it was also done because none of the existing soil is something we want in our garden beds. We needed to completely bring in garden soil. When we were very first starting our garden we didn’t have very much compost of our own from the barnyard compost pile, so we had to buy compost and soil and bring it in to fill the boxes. We started by putting out a layer of straw to help fill the area a bit since we were in need of SO much soil, and then over the years it would break down and add to the soil. We decided to do a mixture of 1/2 topsoil and 1/2 compost. And we decided to save money and not buy the 40 lb bags, instead buy from the bulk pile. We figured that would also save us having to throw away all the plastic bags since we needed A LOT of soil. Boy was that a disaster! The compost we got was FULL of trash, mostly little scraps of plastic and glass. I have no idea why it was in there, but we ended up spending a ton of time picking it all out over the next year as we worked in the garden and I was very concerned that one of the children would get cut by a piece of glass while working in the garden. Thankfully, the next year, when we were ready to add a bunch more soil to the garden because of settling, we had our own compost to add. Each year since then we add an inch or so of new compost on top of the beds and stir it in before we plant in the spring. 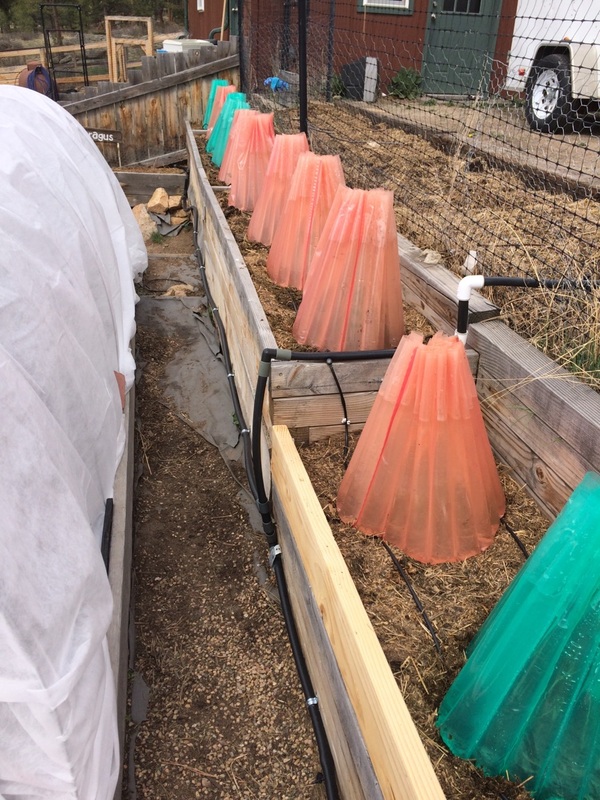 We have also used all of our own compost to fill the boxes as we built them deeper when we realized that they were too shallow (I discussed that in the previous post). The soil has gotten better and better over the years. It improves with age and proper care. I have started 3 gardens in 3 different locations over the years as we moved from house to house, and I have learned that it definitely takes time and patience to get the soil just right. The first year is always the worst. Last garden season was our 6th year growing in this garden and it was the best ever. And as I look back over those six year I can see a consistent upward tilt in how well the garden did, improving each year. Some of that is learning curve of this particular garden plot, but a lot has to do with the soil improving. So, how do we make our compost? 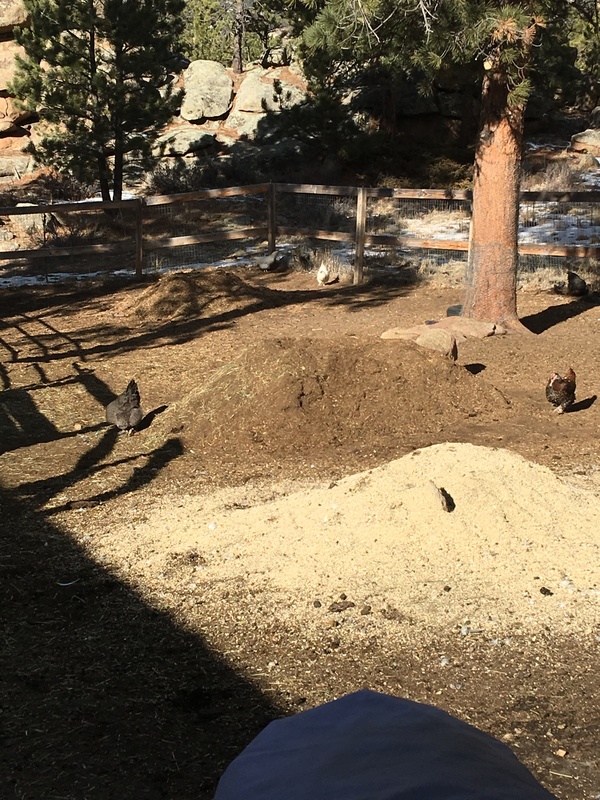 The basic explanation is that we use a mixed livestock barnyard living situation, and we put the compost pile in the barnyard with the animals to allow the chickens to turn the pile for us. Our compost heap consists of kitchen and garden scraps, as well as manure from whatever livestock we have that year (a mix of cattle, goats, sheep, chicken, and rabbits), and the straw, pine shavings, and hay that are used as bedding for the stalls and coops. We clean all the stalls, cages, and coops out onto the compost heap, as well as adding the garden scraps/waste and the kitchen scraps. The livestock will eat a lot of the garden and kitchen scraps we throw on there, but some of them get mixed in. Because we have so much available to compost we generally have 2-3 piles in the barnyard because one pile would be way too huge. At the higher end of the barnyard is the least composted pile, where we add all the new stuff. The one farther down is more composted and the lowest is what we haul to the garden in the spring. As it breaks down we move it down the hill to the next pile. If the upper pile hasn’t had much stall/cage/coop cleaning out onto in awhile and is starting to break down pretty well we move it down right before we do a major clean out so that all the new material is in its own pile to start decomposing. The movement of the piles 3 times a year or so also gives them a big full turn over. And it gets small stirring and turning daily as the chickens scratch through it and then we rake it back into piles every few weeks. 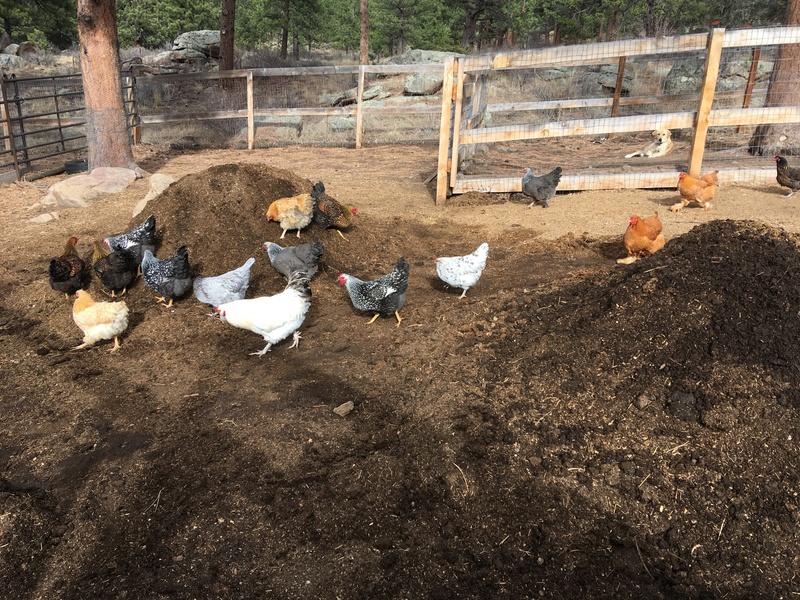 I explain how we make our compost in more detail in a post called Putting Your Chickens to Work Making Compost. 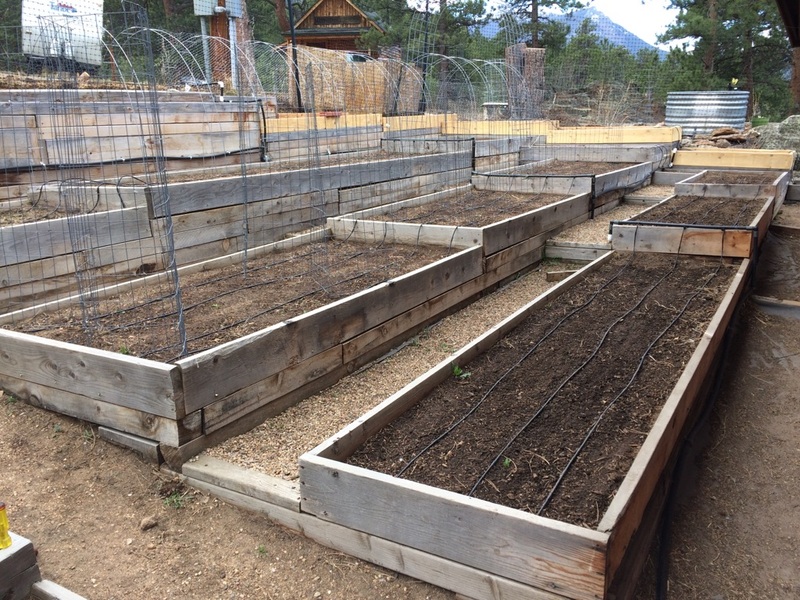 The soil in the high-altitude Rockies is generally not at all useful for gardening. But using raised beds and adding good top-soil and compost can over time give a very good base for growing plenty of produce. And removing troublesome pine trees that drop pine needles into the garden soil will help as well. 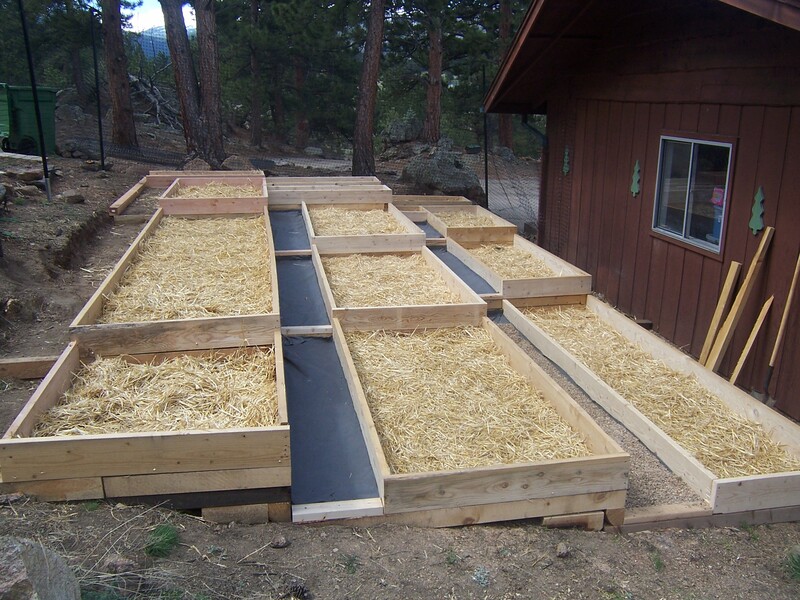 Build raised beds so you can provide all your own garden soil and avoid the decomposed granite soil that is natural to the area. Remove any pine trees around the garden area to prevent needles dropping into the soil and to prevent too much shade. Start with a mix of 1/2 topsoil and 1/2 compost – if you have to buy the compost from the store give it a good examination before buying to avoid trash and glass in it. Add an inch or so of compost each year and stir it in before planting in the spring. Be patient, great soil takes a few years of perfecting and aging. When gardening on steep, rocky mountainsides the terrain presents quite a challenge. Finding a flat space to build a garden is nearly impossible, and the few naturally flat places that exist are often a risky area because the runoff water from the mountain runs right to that area. And even if an area is flat, it is still often on rocky ground which can’t be plowed up for a garden. 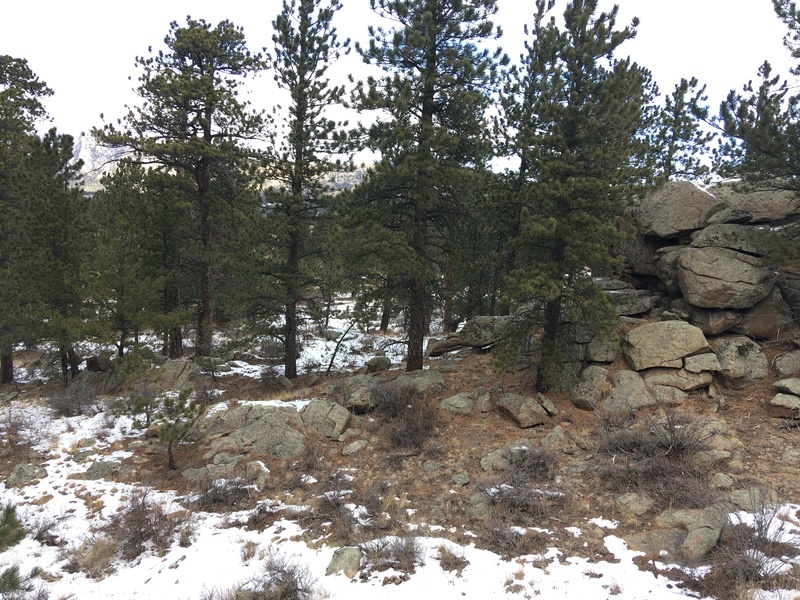 Our property is a rocky mountainside ponderosa pine forest. The most successful option we have found is to terrace the garden area and plant in raised beds. Yes, terracing and building the raised beds is expensive, but when you are dealing with a rocky mountainside it is really the only option because there is nowhere to just plow some rows and have a mostly flat spot with reasonable soil. The investment in the beginning has definitely paid off for us in the long run with a super-productive garden. 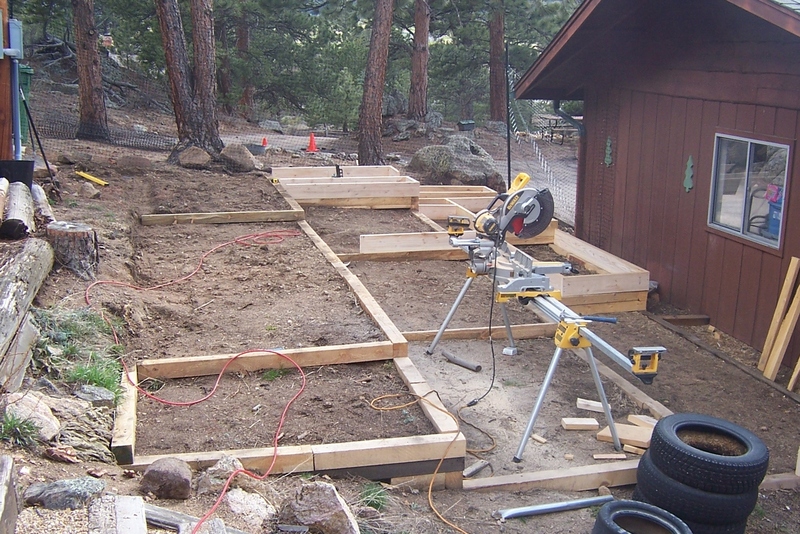 Thankfully, Mtn Man spent his teenage summers working at a local campground building nice, flat campsites on rocky mountainsides, so he is very skilled at terracing. That made our work so much easier. Here is the spot we chose for our main vegetable garden. The rise in elevation from the lower part of the garden to the upper part is about 6 feet over a 20 foot distance, and then about 3 feet rise over a 40 foot distance going the other direction. That gave quite a rise diagonally across the garden from the lowest corner to the highest corner and made the build tricky. And the bedrock is just below the surface of the dirt leaving very little dig-ability – so we had quite a challenge ahead of us. We picked the location of our garden based on the ease of access for us, as well as ease of access to water, and the micro-climate. The dark painted wall of the garage reflects the heat of the morning sun thus warming the garden faster in the morning, gives shade from the intense high-altitude late-afternoon sun, and it is a good windbreak as the majority of our wind comes from that direction. We started by measuring it out and drawing the full outline on graph paper. Then we drew in the beds where we wanted them, with the walkways in between. We drew several different layout options, trying to give ourselves the most plant-able space and the least walkway space. We wanted to be sure we were using the space efficiently. 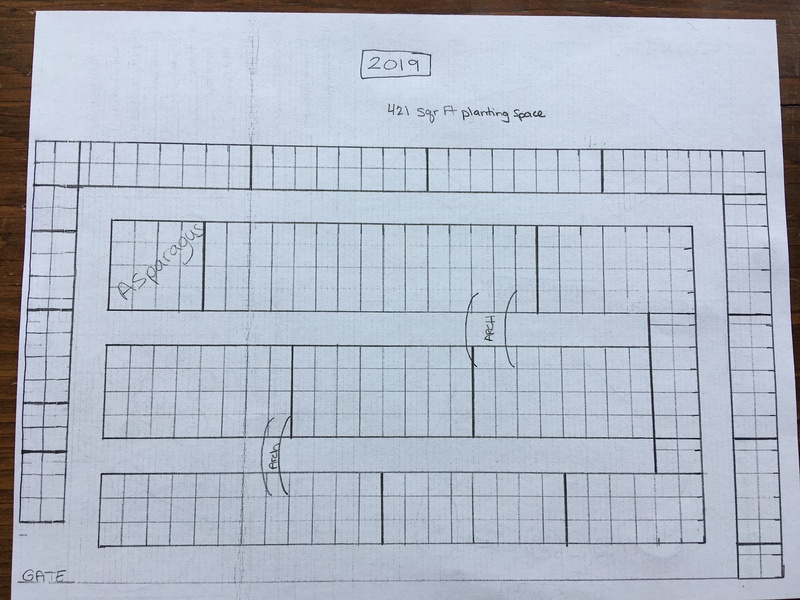 I don’t have that original layout drawings, but below you can see this year’s graph paper drawing that I use to decide what I am planting and where I am putting it. That is the layout of our garden beds and walkways. Once we had the layout drawn on the graph paper, it was time to start making it a reality. We built our main garden beds 4-feet wide and as long as they can be in our garden space. Around the edges of the garden we build them 2-feet wide along the fences (not included in this picture). The 4 and 2 feet wide beds work well for many reasons. An average person’s reach is about 2 feet. So with the 4-foot beds you can easily reach in from either side and get to the middle. And the 2-foot wide ones along the fence means you can easily reach all the way to the fence. Also, the size makes it easily compatible with the various hoop tents and trellises that we use, which will be discussed in a future post. Our paths are about 18-inches wide to give us the most plant-able space possible, but late in the season, when the garden is jungle-like, I do wish the walkways were wider. We put down weed fabric covered by pea gravel in the walkways. The weed fabric was easy to put in because we were able to staple it to the raised beds, holding it in place all along the walkway. The fabric and gravel help a lot in that we don’t have to worry about weeding the walkways. The garden has enough work and weeding of its own, why waste time weeding walkways? 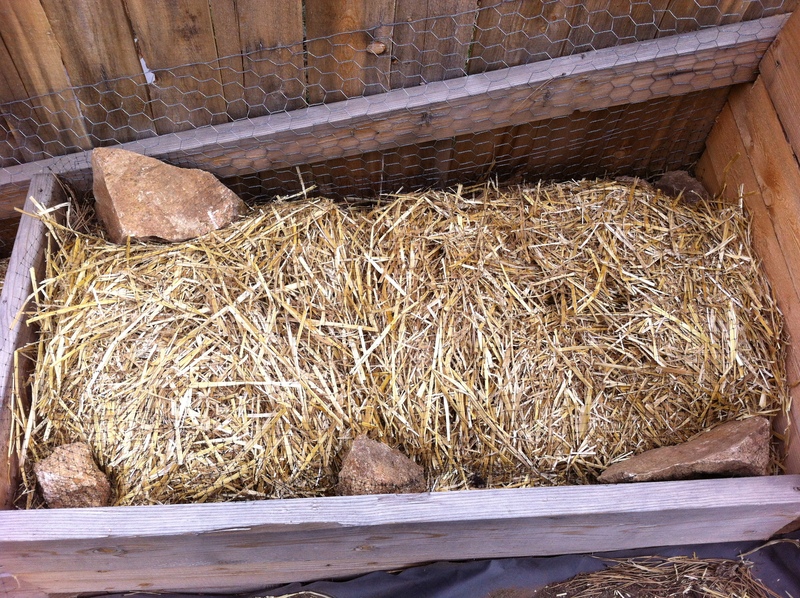 We lined the bottom of the raised beds with straw, and then put compost from the barnyard over top of that. We will discuss soil and compost more in a future post. Originally, the garden beds were built to be about 9-inches deep, depending on the area of the garden and how we did the terracing with the bedrock under it. But over the years we have found that they grow much better when they are deeper, so we have been expanding each raised bed section to be about 13-18 inches deep and that has helped a LOT. In addition to the main veggie garden, we have a few other garden areas around the property. 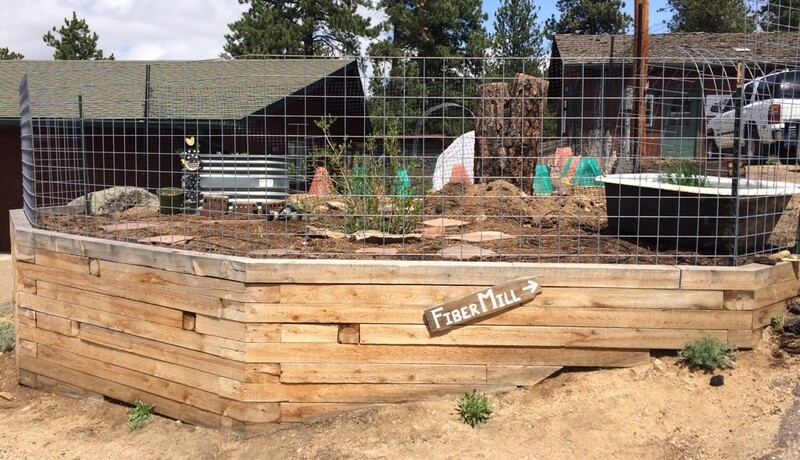 They use many of the same concepts of using raised beds to deal with the steep rocky terrain, but with some creative changes to how we built them. The Garlic and Onion Patch raised bed was built with some old railroad timbers we found on our property. 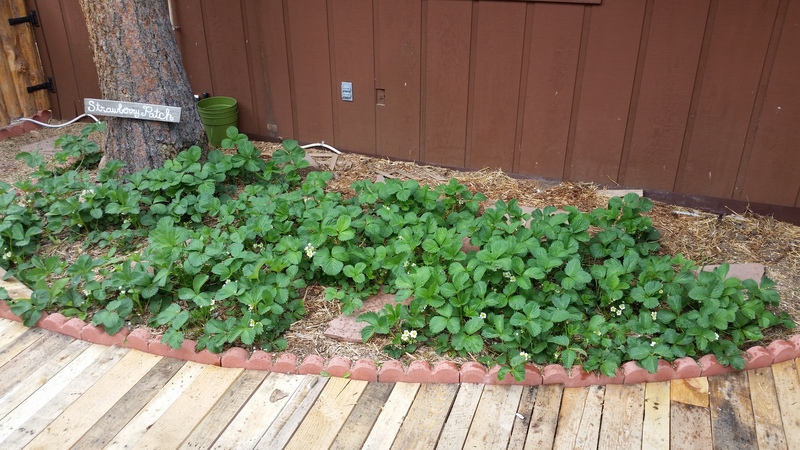 The Strawberry Patch was pretty flat and had pretty good soil in that area to begin with, so we just used some edging bricks to build that bed and added a few inches of compost to that area. 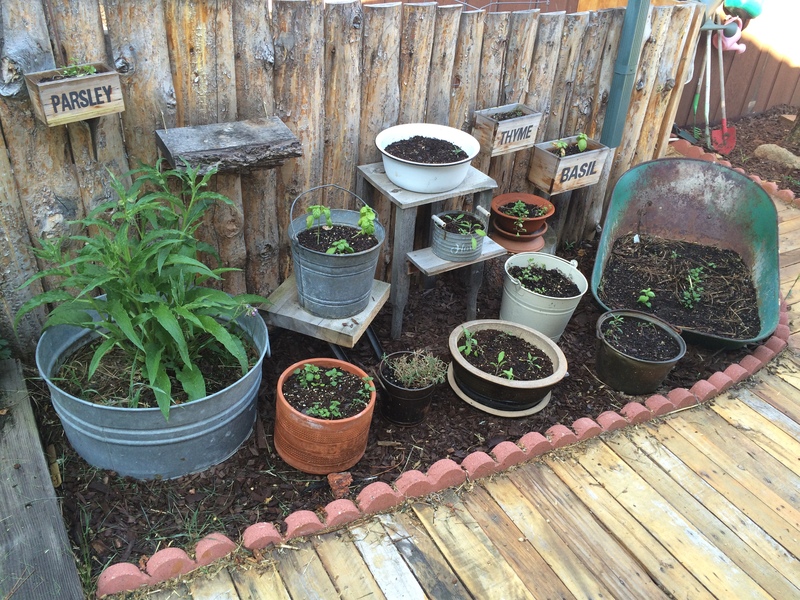 And our herb garden is made with various fun containers for planting in. 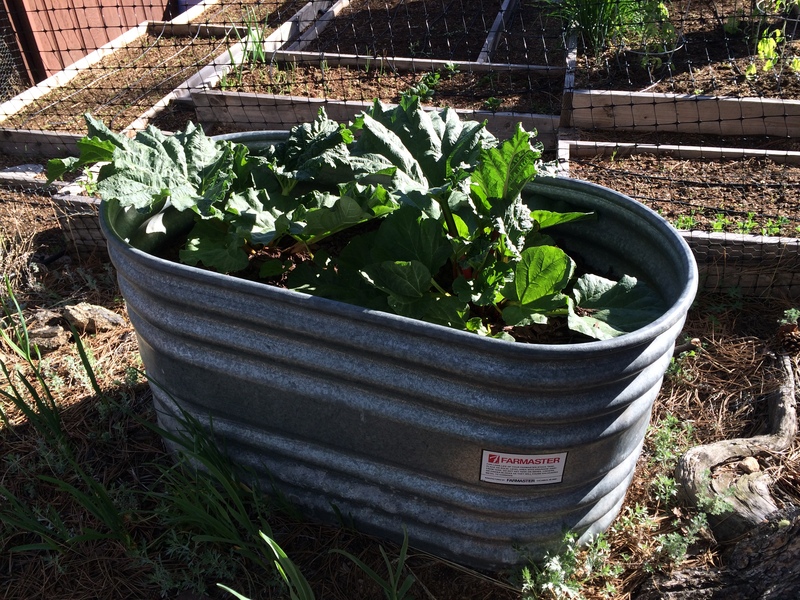 We have used a water trough and an old clawfoot tub as “raised beds” too. There are so many creative options for how to build raised beds and planting areas. With a little planning, and a lot of effort, you can overcome the steep rocky terrain of the high-altitude Rockies. Plan the garden area to have as much plant-able space as possible, minimizing walkways and maximizing planting beds. 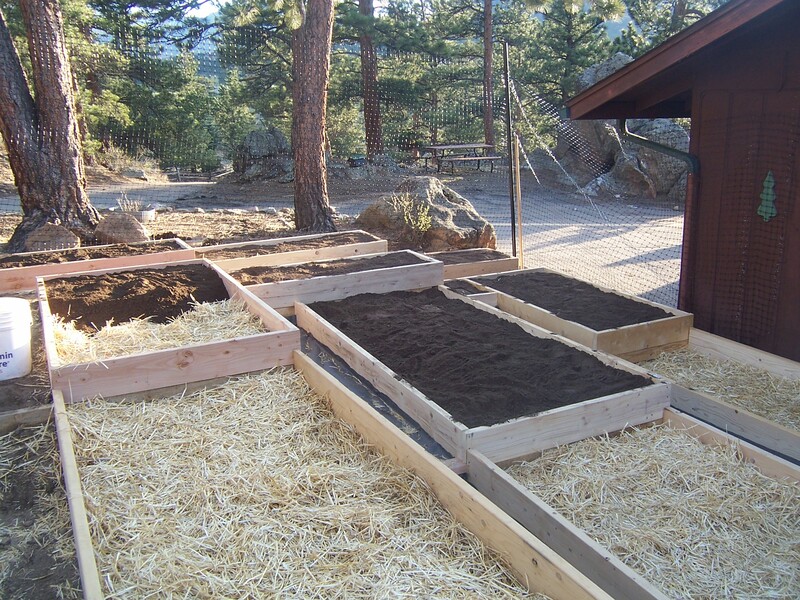 Build raised beds that are about 15+ inches deep, 4-feet wide (2-feet wide along fence) and the length of the garden area. 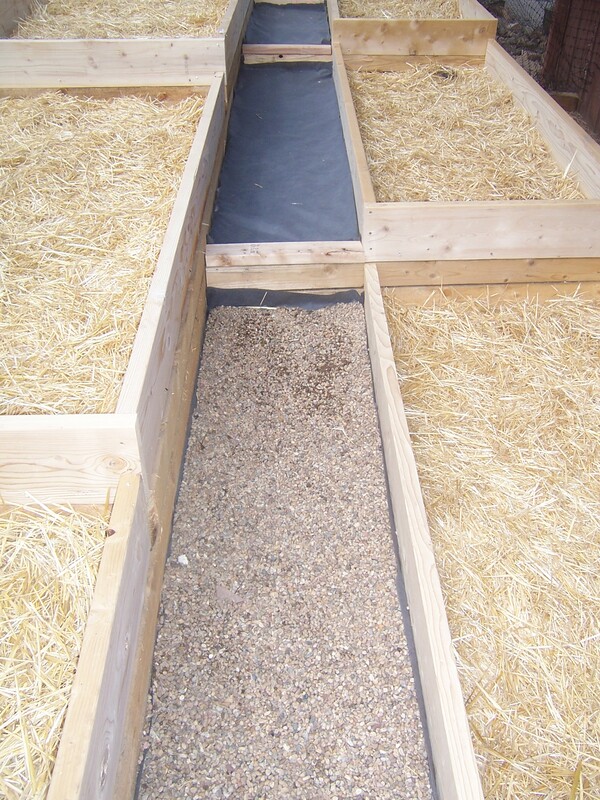 Build 18-inch wide gravel paths (or wider for comfort and ease of use) lined with weed cloth. As the snow flies outside my mind begins to go to gardening. Even though our last frost isn’t until early June, we actually start gardening in March with indoor seed starting, so January and February are usually my garden planning months. But over the many years we have been gardening here we have learned a lot of tricks to make our garden successful. Last year our garden boasted over 490 lbs of produce harvested from about 500 square feet of plantable garden space. 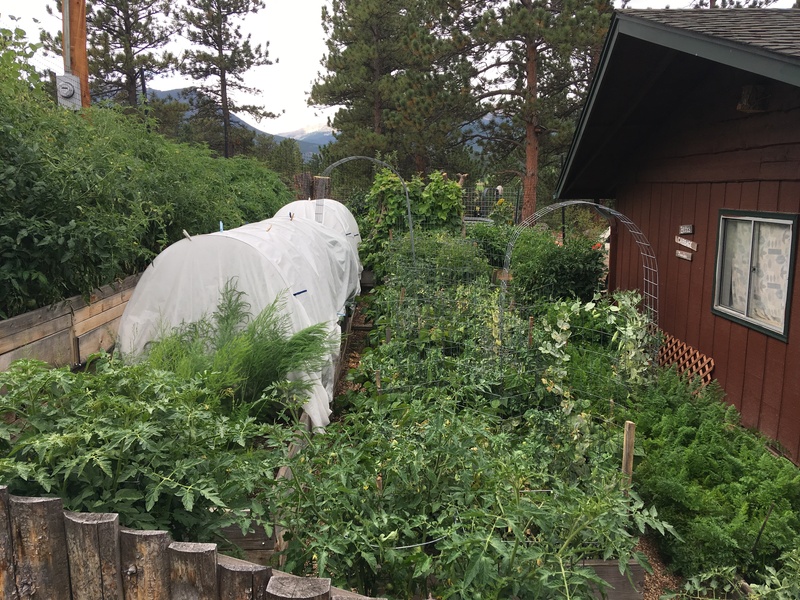 So as we plan our garden for this spring I would like to share a series with you on how we have made our garden so successful in the high-altitude Rocky Mountains.